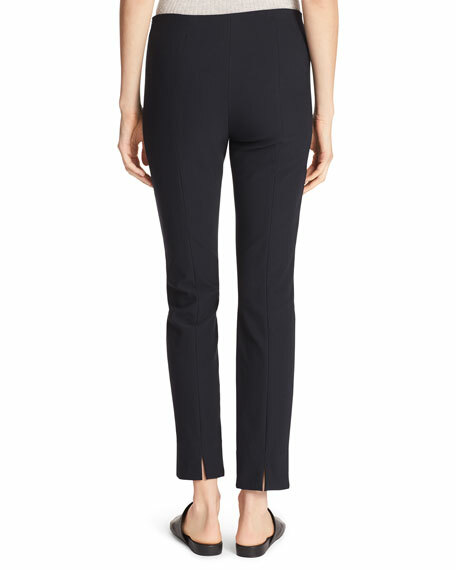 Vince leggings in Italian bi-stretch suiting fabric. Cropped just above the ankle. Ingrid & Isabel active capri leggings with mesh panels, featuring Crossover Panel?? for lower back support. Moisture-wicking, antimicrobial fabric with four-way stretch. Contoured panel accommodates a growing belly. Formfitting legs. Ankle length. Body/belly, nylon/spandex. Imported. Johnny Was "Levi" leggings in eyelet embroidered stretch-cotton jersey. Mid-rise; narrow, elasticized waistband. Fitted through straight legs. Ankle length. Pull-on style. Cotton/spandex. Machine wash. Imported. Please note: This merchandise may have a distressed effect. It is a unique feature that enhances the product and is not considered a defect. Koral Activewear "Chameleon" leggings in scuba-knit performance fabric. Features metallic striped inserts at sides. High-rise waistband. Second-skin fit. Ankle length. Koral Activewear "Chameleon" leggings in scuba-knit performance fabric. Features metallic striped inserts at sides. High-rise waistband. Second-skin fit. Ankle length. Pull-on style. Polyester/spandex; combo, polyester. Power mesh lining, nylon/spandex. Made in USA of imported material. Koral Activewear "Costa" infinity legging with mesh detail. High-rise; wide elastic waistband. Figure-forming legs. Ankle length. Pull-on style. Fabric 1: Infinity , nylon/Xtra Life LYCRA?? Sport spandex. Fabric 2: Evanesce, nylon/spandex. Fabric 3: Open mesh, nylon/spandex. Made in USA of imported material.